You Are Here: Home > No comparison between 2018 Chevrolet Traverse vs 2018 Volkswagen Atlas! The 2018 Chevrolet Traverse, outclasses and outranks the 2018 Volkswagen Atlas in pretty much every category that there is. Every category, if we aren’t trying to be too polite. There really isn’t a competition here, but the ‘proof is in the performance.’ An excellently designed nine speed, automatic transmission takes the Traverse to a whole new level in terms of drivability. The cargo space, enormous is the only way to describe it. HID headlights that come standard with the vehicle add to its naturally appealing nature. Interior comfort and brilliant spaciousness throughout the vehicle are also added bonuses. Besides being a late entry into the mid-size SUV arena, there are still a few worrying factors that make one question whether the vehicle is worth purchasing. Will buyers be interested in it is the first aspect to be considered? The ‘Four Cylinder’ does not come with an all-wheel-drive option. This is rather disappointing when one considers the category that the 2018 Volkswagen Atlas is competing in. It makes it very difficult to then promote a vehicle that does not offer, at least the same capabilities as its competitors. A diesel option would have scored the 2018 Atlas some points, but sadly it fails to impress, yet again. The interior is mundane and quite frankly boring. It really doesn’t match the price tag that the midsize SUV comes with. The EPA ratings are again, not up to standard. With a higher ‘mile per gallon’ ratio than most of the competition, the 2018 Volkswagen Atlas is seriously not a smart, economically inclined purchase. 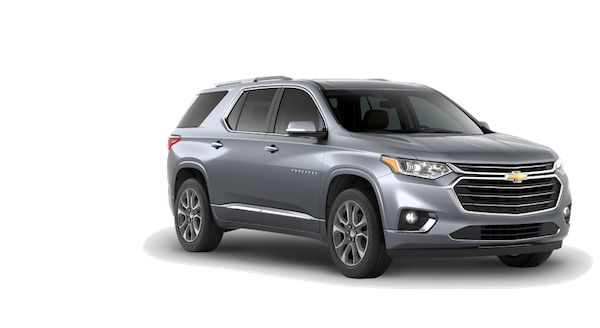 The V6 powered 3.6 liter of the 2018 Chevrolet Traverse has 310 hp and 266 lbs per ft – torque. A V6 powered engine at the top of the 2018 Atlas’s range, only comes in with 276 horsepower and 266 lbs – ft of torque. 23 cubic feet of room is available at the rear, even if the third row of the 2018 Chevrolet Traverse is occupied. This is actually larger than most competitors. With the second row folded down, a further 58.1 cubes will be enjoyed. Now with both the third and second row stowed away, the 2018 Traverse offers an exceptional 98.2 cubic ft of cargo space. The upgraded automatic, nine speed transmission of the 2018 Chevrolet Traverse makes a major improvement to the overall powertrain. Thanks to the directly injected engine, the 2018 Traverse is able to dart off the line tremendously. When compared to the 2018 Volkswagen Atlas, let’s just say that the Atlas will not beat the Traverse in a drag race. Besides its powerful performance, the 2018 Traverse also offer quite a smooth and comfortable ride. Maneuvering is simple and the engine assists with efficient overtaking capabilities. Acceleration remains impressive from pull off, all the way to the upper ranges of the rev counter. 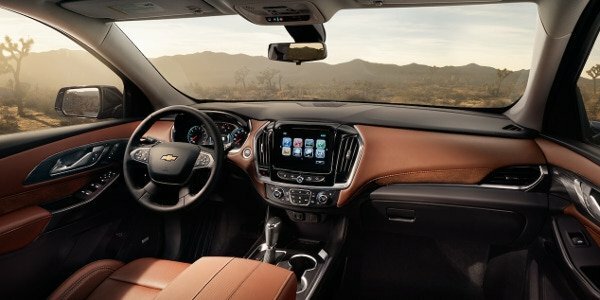 Chevrolet has included some of the best technology on the market into their 2018 Traverse such as Apple CarPlay and Android Auto for seamless smartphone connection, a brilliant 7 inch touchscreen and also Bluetooth connectivity. The interior of the 2018 Chevrolet Traverse is quite large. Well designed with comfort in mind. The front seats are both supportive and makes for a lovely driving experience. The second row offers similar support and the third row can confidently be described as roomy. Driving for a couple hundred miles without stopping is an effortless task, thanks to the brilliant comfortable seating offered throughout the 2018 Traverse. 33.5 inches of spacious legroom is offered at the third row, and can cater for very tall individuals effortlessly. The interior of the 2018 Volkswagen Atlas is rather mundane and only made worse by the resounding grumbling of the tarmac, especially in the second row.The 2018 Volkswagen has not earned great crash test safety scores. This is definitely not something a purchaser with a family wants to hear. The 2018 Chevrolet Traverse on the other hand, has received an overall – 5 Star rating from the federal testers. Now this is what would entice a buyer with the safety concerns of a family at heart.